"The City of Stamford, VFW Springdale Post 9617, and the American Legion Post 3 installed a Liberty Elm and plaques in memory of Congressional Medal of Honor recipients John Cridland Latham, WWI, and Homer Lee Wise, WWII. The ceremony included speeches by Stamford's arborist, state and city officials, and war veterans; recitations of poetry; patriotic music and bagpipes. After the unveiling of the plaque and placing of the wreaths was a gun salute by the Sea Cadets." A second Liberty Tree Memorial, dedicated on November 3, 2018, by the Lake Sumter Sons of the American Revolution marked their 30th anniversary. According to Ron Grove, treasurer for the chapter, "Our past president Jerry Harwich and SAR state president, Pat Nieman attended the event. Our current president's wife and grandchildren revealed the plaque. The color guard, which included our state treasurer and 2 members from another chapter, also participated. Our president Allan Lane and Jim Carl, our veterans chairman presented a commendation to Glenn Bowron, a WWII vet. The the color guard assembled behind the tree and plaque while the youngsters read a proclamation. 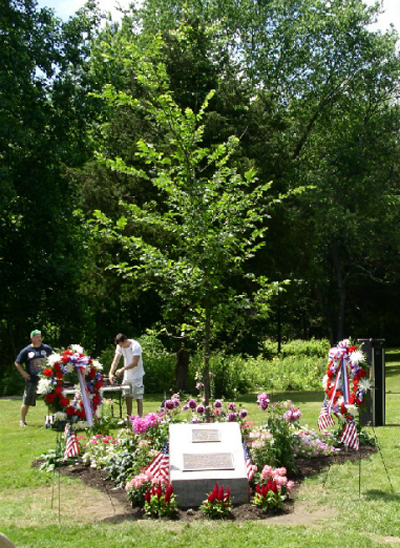 The Liberty Tree Memorial is located at the American Legion Post where we meet. We treated everyone to lunch. It was a great day!" 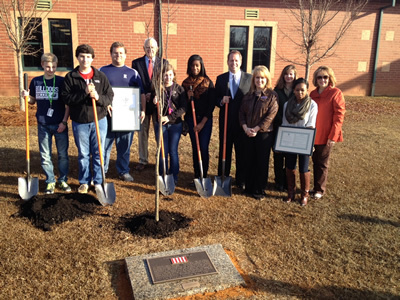 A Liberty Tree Memorial was installed at Newberry Middle School and was made official by the City of Newberry. The gift was made possible by a grant from the Armstrong Foundation. Kelli Farmer, principal at Newberry Middle School, said she was grateful their school was chosen as the site of a Liberty Tree Memorial. Assistant city manager Matt DeWitt said, "The program this year is very special as it will not only create a legacy for others to enjoy, in regards to the tree's planting, but it will also preserve a piece of our Nation's history which is a legacy from which we have all come." "A small cluster of people stood beneath the majestic trees in Kiwanis Park as they dedicated a new addition that honors the past and celebrates future conservation efforts. 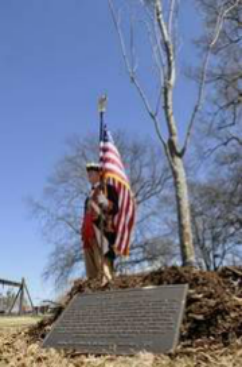 The Montgomery Tree Committee (MTC) and members of the local chapters of the Alabama Society of the American Revolution and the National Society of the Sons of the American Revolution marked Arbor Day by establishing a Liberty Tree Memorial at the park in Old Alabama Town. Larry Grewelle, MTC treasurer and organizer of the dedication, said the elm tree is a symbol of the American Revolution, one adopted by the Sons of Liberty to represent independence. These patriots united secretly against (the) British during the Revolutionary War, and they often held meetings under the Liberty Tree in Boston...."We support and celebrate the history of our country and what made it strong ,"said Sue Jaworowski, publicity chair for the Peter Forney chapter of ASDAR... "We just wanted this (Memorial) to be ceremonial, something to memorialize the history," Jaworowski said." 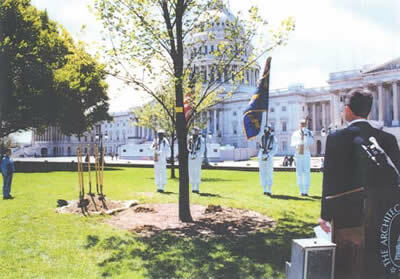 Friends, family and members of No Greater Love, an organization dedicated to providing programs of remembrance for families who lost loved ones in service to our country, established a Liberty Tree Memorial to honor Senator J. Robert Kerrey (Nebraska) on the occasion of the 30th Anniversary of his earning the Congressional Medal of Honor and the Navy SEALS and members of Delta Platoon who served with him. 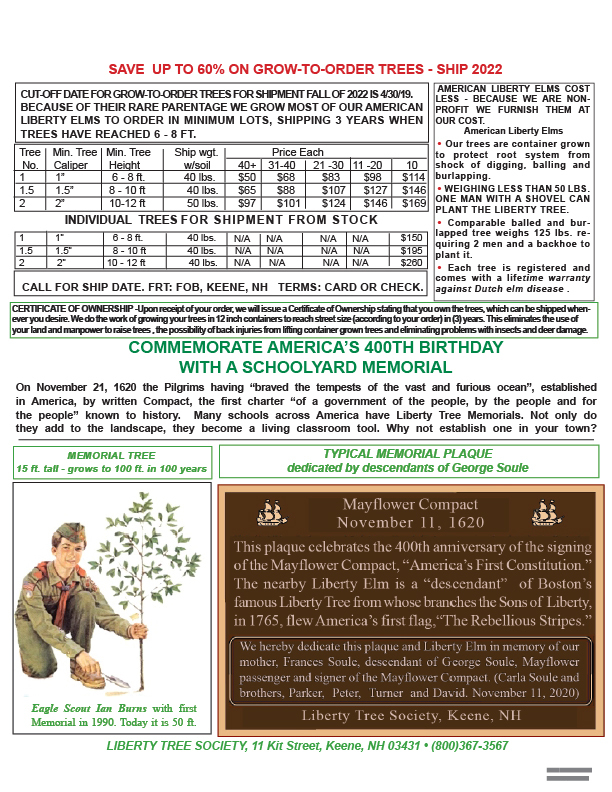 "To honor Senator Kerrey, we have selected a Liberty Elm which is our country's enduring symbol of freedom. 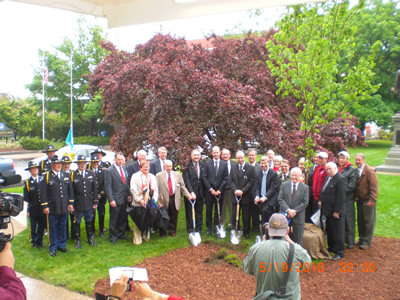 It is Senator Kerrey's enduring patriotic service to his country that we dedicate this tree." 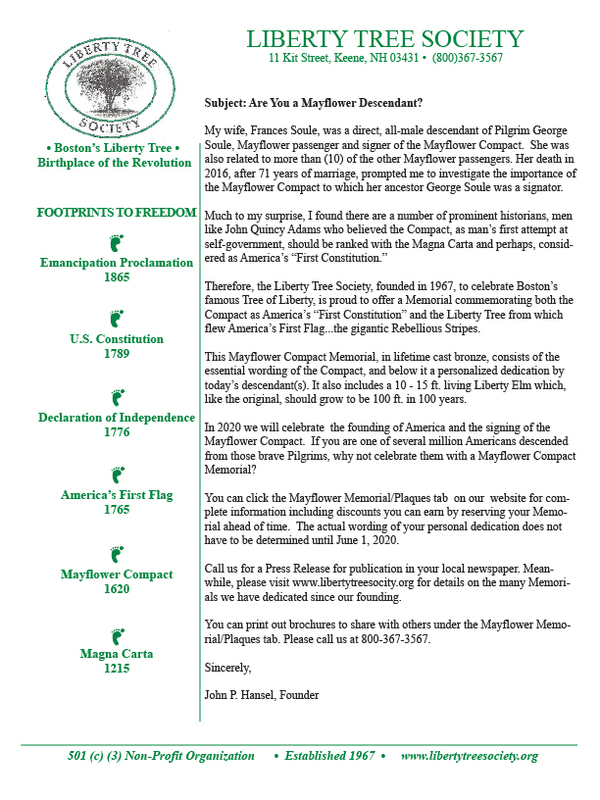 A Liberty Tree Memorial was established on the State House grounds to celebrate the 185th anniversary of French General Lafayette's visit to Concord, and his address to a joint session of the New Hampshire General Court. His visit was part of a national tour to the then 24 United States to commemorate the 50th anniversary of the American Revolution. By the time of the Revolution, the original Liberty Tree was over 100 ft. tall and had become popular as the rallying point for protests against George III and a meeting place for the "Sons of Liberty." In an act of revenge, the British troops cut down the "Liberty Tree" in August of 1776. Reflecting on that moment, General Lafayette said "The world should never forget the spot where once stood the Liberty Tree, so famous in your annals." A special American Elm put its roots down across the street from Brook Fountain, but the elm is much more than a tree. It is part of a Liberty Tree Memorial, a living tribute to our country's foundation and freedom. A grant was awarded to Marshall Rotary BSA Troop 337, as sponsored by the Marshall Area Garden Club (MAGC) . 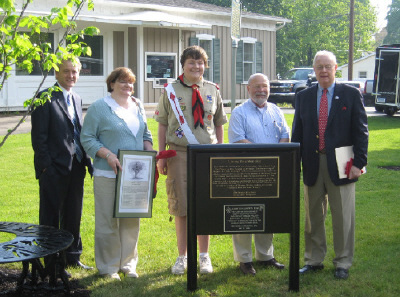 Jacob Davis, an Eagle Scout in Troop 373, coordinated the planting of the tree, the construction of the memorial, and the dedication ceremony along with MAGC member Alice Schneider…U.S. Congressman Dr. Joe Schwartz explained, from personal experience and history, the significance the right of liberty, as secured by the Constitution plays in our society. Schwartz also reminded the crowd that liberty was earned by the nation's forefathers at a heavy cost, and that Thomas Paine was renowned for his activities advocating democracy and liberty during the American revolution." for publication in your local newspaper.